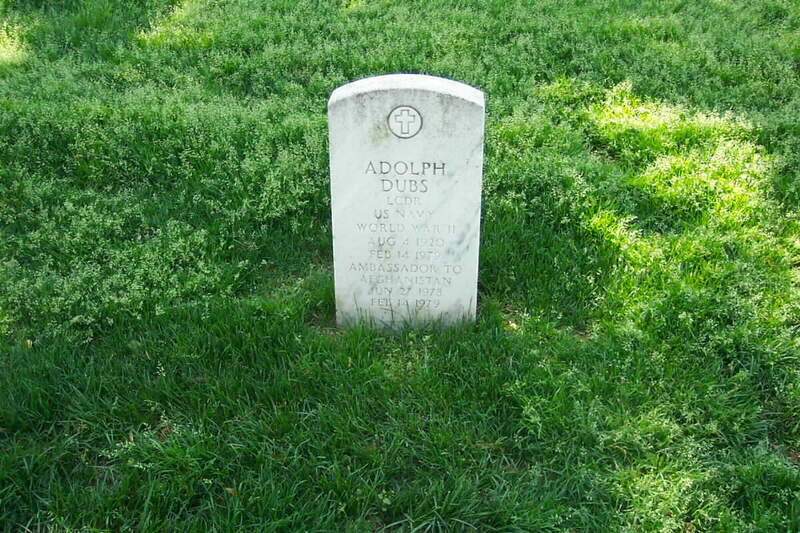 Adolph Dubs (1920-1979) of Maryland. Born in Chicago, Illinois, August 4, 1920. Served in the U.S. Marine Corps during World War II; U.S. Ambassador to Afghanistan, 1978-79. Assassinated in Afghanistan, February 14, 1979. Interment at Arlington National Cemetery. Adolph Dubs, the U.S. ambassador to Afghanistan, was killed in an exchange of gunfire between Islamic extremists who kidnapped him and Afghan security forces. A top expert in Soviet affairs, Adolph Dubs, was sent out as the U.S. Ambassador on the basis of business as usual. Within months Dubs died in a hail of gunfire from Afghan troops, under Soviet advisers, as they sought to 'rescue' him from four kidnappers in a Kabul hotel room. His death merited a weak protest, and the start of the phasing out of the already stagnant U.S. aid program. Nine years later another ambassador was to die violently in suspicious circumstances, again with possible Soviet involvement. This time the reaction was a cover-up. Bruce K. Byers was USIS Press Attaché at U.S. Embassy Kabul from 1978-79. Byers, who joined the Foreign Service in 1971, also has served in Tehran, Iran; Bombay, India; Vienna, Austria; Bonn, Germany; Washington, D.C.; and Warsaw, Poland.